I took one look at the personnel in Fly and thought‚ "This'll be easy! Jeff Ballard and Larry Grenadier are the rhythm section for Brad Mehldau! Mark Turner stood toe-to-toe with Kurt Rosenwinkel‚ whose guitar work is seriously next-level!" By this logic‚ Sky & Country should be positively dizzying‚ and it is - provided you drill deep enough. This is not a disc to play in the background while you're cooking‚ or cleaning‚ or screwing‚ or whatever; this is a disc you need to sit with‚ headphones securely fastened to your brainpan. Only then will you appreciate what a skin-tight‚ purposeful unit Fly is‚ and how Sky dovetails with ECM svengali Manfred Eicher's "less is more" sensibility. Ballard works cymbals and rims to distraction while Turner lays down the snaking melody on "Lady B" and Grenadier acts as wingman. The piece moves quickly but quietly as Turner breaks off from Grenadier and flies on his own. There's a brief pause as Turner plays in the clear‚ and then everyone gets back to the groove. Fly uses rest stops like this throughout Sky‚ letting each member get out long enough to stretch without breaking the trip's momentum. Turner's unadorned attack is a brave choice. On sax-trio discs like Joshua Redman's Back East and Donny McCaslin's Recommended Tools‚ each reedman happily puts the pedal to the metal. Turner doesn't hesitate to blow it out here - his soprano sax on the title track heads right for the stratosphere - but his overall sound evokes Charles Lloyd‚ who overwhelms the senses without engulfing the music. However‚ without the foils Lloyd uses to add color and highlights‚ Turner seems alone on an island. That's where headphones come in: They reveal the smart‚ intricate atmosphere Fly creates as a group. Turner's wonderfully lazy tenor on "Dharma Days" puts his band mates' warp-speed dialogue in fine contrast. Grenadier sandwiches the slow blues "C.J." 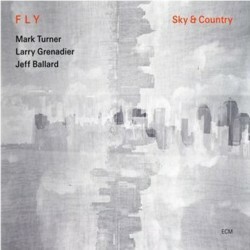 with bass lines suitable for kabuki theater‚ and bows way down low on the spiritual "Transfigured" while Ballard uses mallets to turn drums into tympani. Like I said‚ Sky & Country is not a passive disc‚ in that you can't avoid getting involved with it. Yes‚ that takes time. But it's time well spent.